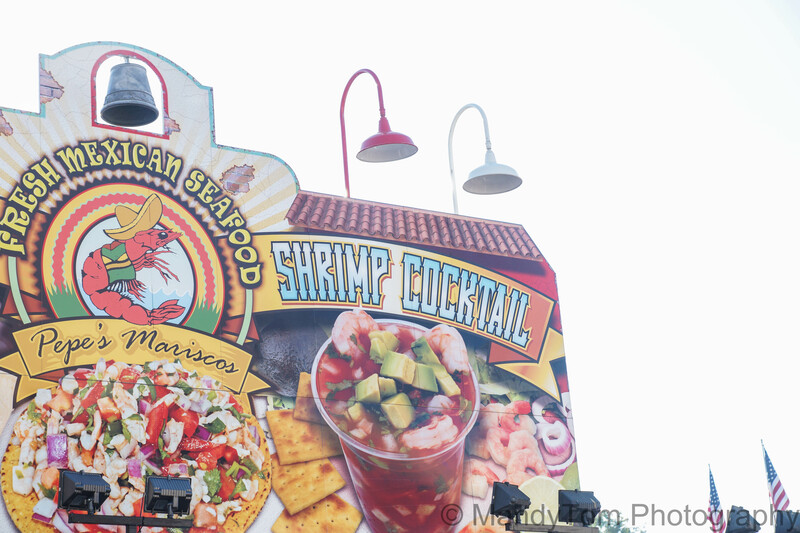 We’re already halfway through this year’s OC Fair! People say the fair is the same every year and that is mostly true but you only get to eat yummy fair foods once a year. 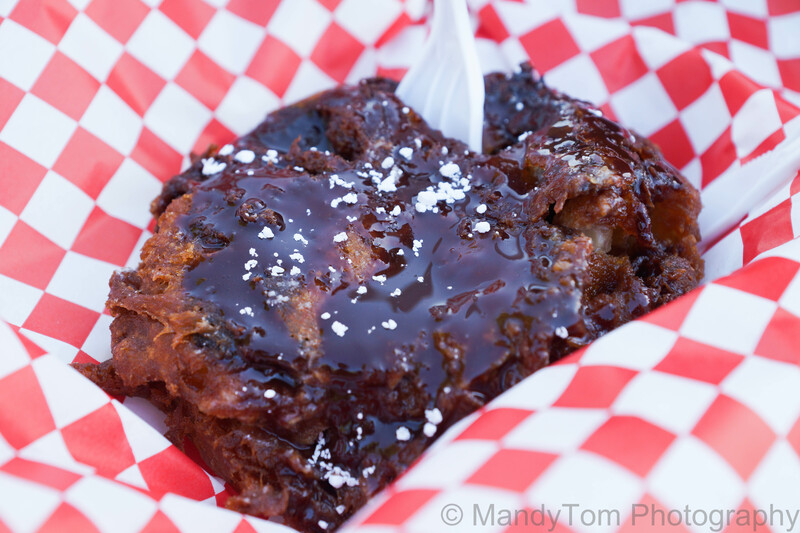 That’s why I want to share my MUST EAT OC Fair foods. These are my must-eats every year when I go. I’m a HUGE fried clams fan. 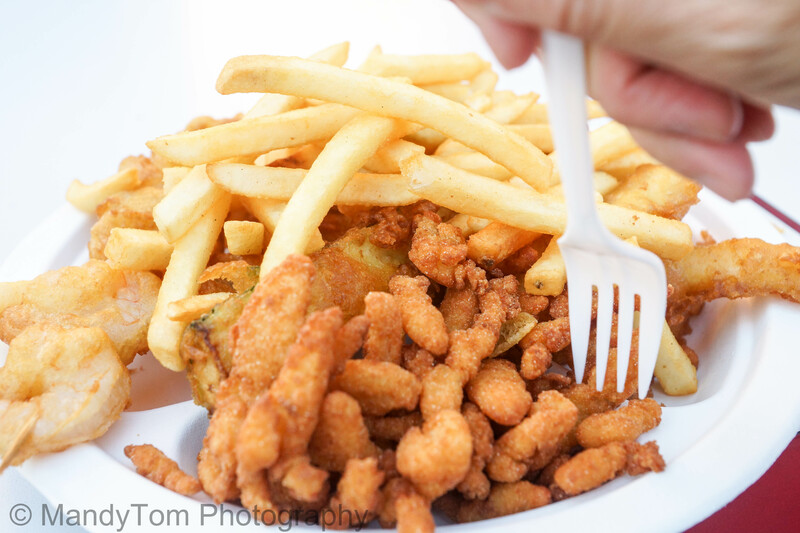 When I was little, my mom used to buy frozen fried clams from the grocery store and, well, fried them. We would dip them in ketchup and they were oooooooh so yummy. But, it’s been YEARS since I’ve seen them at the grocery stores and I have no idea where to find them again. So when I saw fried clams at the fair, I had to try them. It was $16 for “The Boat Load” which contained 1 fish, shrimp sticks, fries, fried clams, calamari, zucchini. The clams were the best…no doubt! Next time I will probably just get the clams. I know you can get shrimp cocktail anywhere, but this is different! I always get the large to share with my husband…but I’m pretty sure I eat 80% of it :P. In addition to the shrimp, there’s avocado, salsa, cheese, and they also give you a cracker to add in. It’s also really refreshing. I can eat 10 of these in one sitting (not proven)! I love funnel cake. 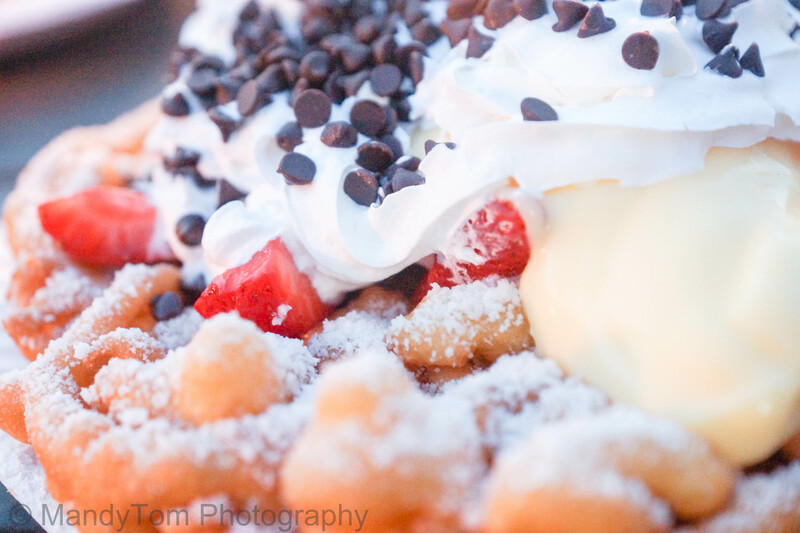 My very first funnel cake was from Knott’s Berry Farm and that’s when I fell in love. What is there not to love? There’s powdered sugar, fruits, whipped cream, and all kinds of yummy stuff. There are funnel cake booths everywhere at the fair but I like the one next to the stage/arts crafts village most. I usually get “The Works”: Strawberries, whipped cream, bavarian cream, chocolate chip, peaches. 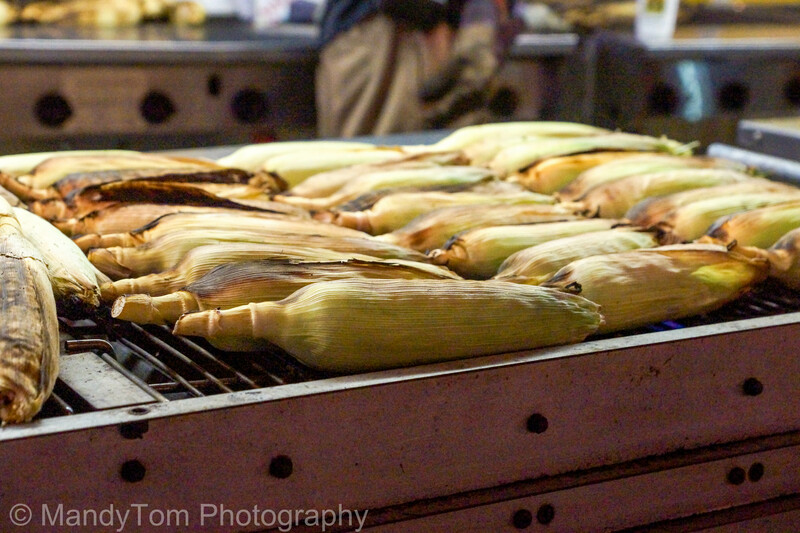 The fair charges $4 for 1 grilled corn. For that price, I can get 16 corn and grill them myself but I’m too lazy. Also, it just tastes better at the fair :P. I like mine dipped in butter with a little bit of seasoning. Turkey legs are so good and you don’t get to eat turkey leg on a regular basis. Story: One day at Disneyland, husband and I were hungry and decided to get a turkey leg. It was the driest and saltiest turkey leg we’ve ever eaten. Definitely spoiled by fair turkey legs! 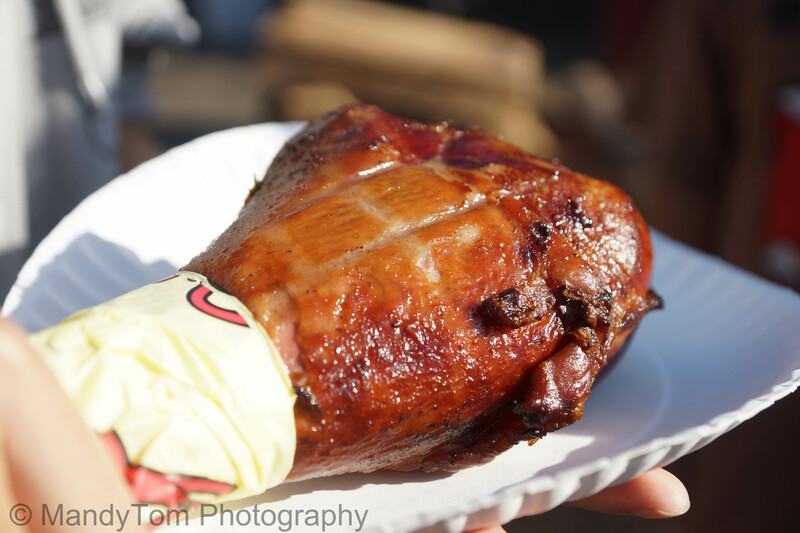 After that incident, we’ve appreciated Juicy’s turkey legs for the smokey flavor, and tenderness every time we eat it at the fair. We tend to go to the fair a few times each summer, so we decided to get the souvenir cup. At the same place where you get the shrimp cocktail, they have watermelon agua fresca. 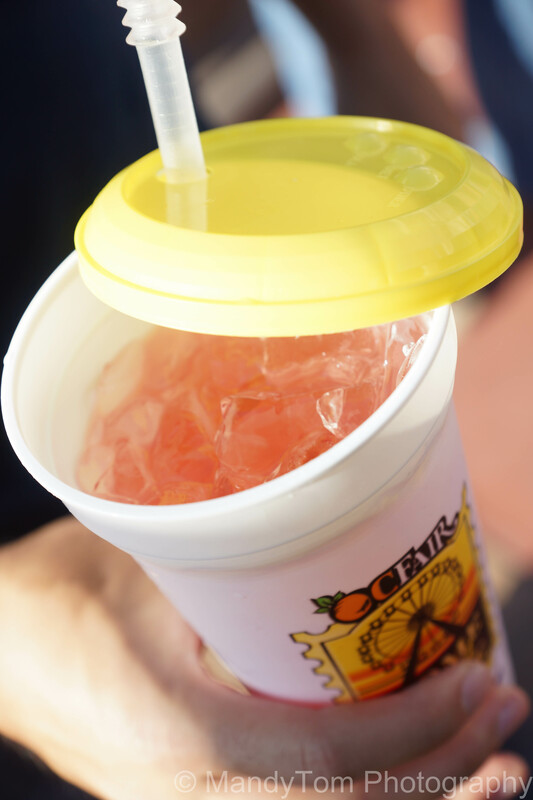 So we decided to get the souvenir cup with agua fresca ($5). Each time you refill, it’s only $2.75. The watermelon agua fresca quenched our thirst big time in the crazy heat. I’d rather spend $2.75 for agua fresca than soda! It’s really good, watermelon juice with a little sugar. Yum! 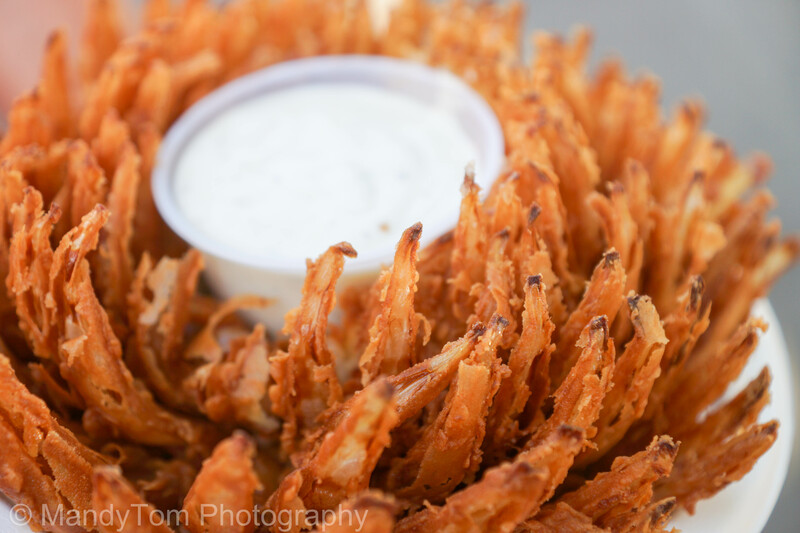 My all time favorite fair food: the bloomin’ onion. I like onion rings but I dislike thick batter and non-fresh onion. The bloomin’ onion is none of those and the perfect food to share. The onion is cut so that it looks like a flower with petals sticking out. You just peel each piece out and dip it in the ranch in the middle. Super fresh and yummy. However, I’d recommend not eating the last row since it’s always drenched in oil! I think we paid $8.50 for one pulled pork sandwich. My husband loves pulled pork sandwiches. It was good and comparable to other pulled pork sandwiches anywhere else so we will most likely not try it again. Good but we can get it elsewhere as well. Nothing special and I prefer funnel cakes if I want something sweet. My brother wanted to try this out and thought it was a drink (mango lemonade). 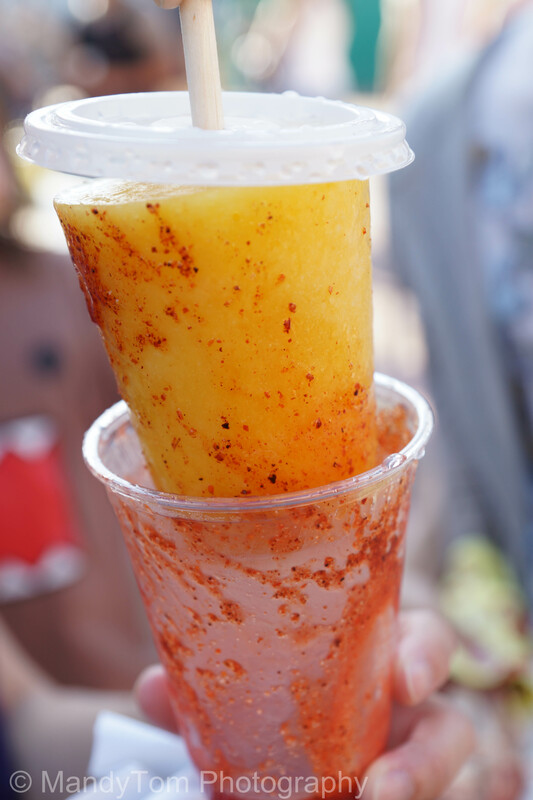 To all of our surprise, it was a mango popsicle dipped in chili powder and what tasted like tamarind. First taste reminded me of the tamarindo candy that I love. But the mangoneada was a bit weird for my taste: too sweet and too sour. Through a moment of bravery, I tried fried frog legs. It tasted like chicken and I will never try again hahaha! My 10 year old cousin kept saying how yummy the fried Klondike bar was, so we decided to try it. Bleeeeh. It tasted like batter with chocolate syrup. This is definitely the nastiest thing I’ve ever had at the fair. Shaped like donut holes but tasted like medicine. Save your money and don’t try this!!! So there you have it, my list of fair foods. 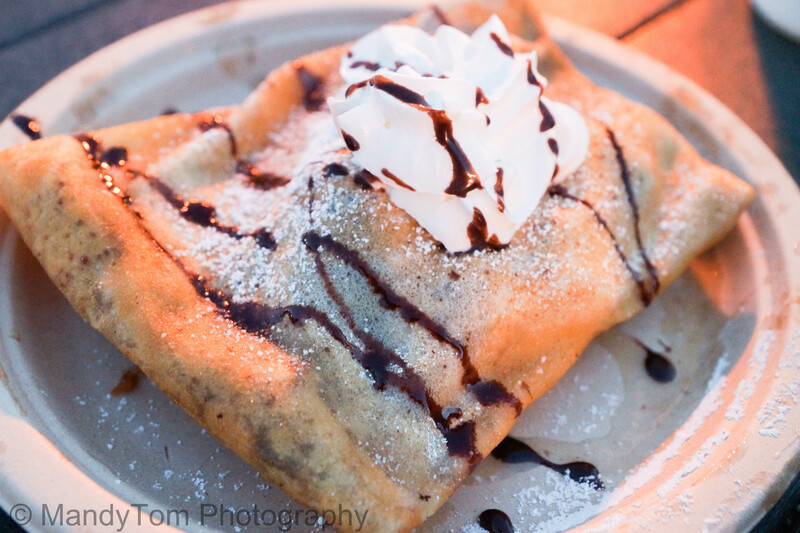 I still want to try chocolate-covered bacon and fried butter and many other things!